Industry Experts, Inc. unveiled the new global market research report entitled “Piezoelectric Materials – A Global Market Overview“. As per the new report, accounting for a share estimated at 40.2% in 2017, worldwide demand for Piezoelectric Materials is the largest for the Consumer Goods industry. Piezoelectric materials constitute various types of ceramics, polymers, crystals and composites that can generate a voltage when being subjected to an external pressure or, conversely, expand upon the application of a voltage. A piezoelectric material’s response to mechanical forces/pressures resulting in the generation of electric charges/voltages is referred to as the direct piezoelectric effect. In contrast, the application of electric charges/fields causing the induction of mechanical stresses or strains is termed as the converse piezoelectric effect. Asia-Pacific leads the global market in terms of demand for piezoelectric materials, which is likely to be sustained by burgeoning auto and consumer electronics industries. The use of piezoelectric materials in the automotive sector has grown by leaps and bounds and they are finding application in fuel injectors, tire pressure sensors, engine knock sensors, backup sensors, dynamic pressure sensors and a number of other crucial safety features common in modern cars. The report reviews, analyses and projects the Piezoelectric Materials market for the period 2014-2023 globally, and the regional markets including North America, Europe, Asia-Pacific, South America and Rest of World. The regional markets further analyzed for 15 independent countries across North America – The United States, Canada and Mexico; Europe – France, Germany, Italy, Russia, Spain and The United Kingdom; Asia-Pacific – China, India, Japan and South Korea; and South America – Argentina and Brazil. Global markets for Piezoelectric Material types analyzed in this report comprise Piezoceramics, Piezocomposites, Piezocrystals and Piezopolymers. The consumption of piezoelectric materials in various applications studied include Actuators, Generators, Motors, Sensors, Transducers and Others. 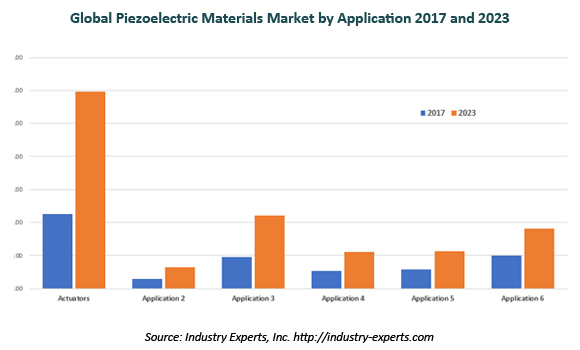 The report is also explores the market for piezoelectric materials in various end-use industries comprising Aerospace & Defense, Automotive, Consumer Goods, Healthcare, Information & Telecommunication and Others. This 364 page global market report includes 214 charts (includes a data table and graphical representation for each table), supported with a meaningful and easy to understand graphical presentation, of the market. The statistical tables represent the data for the global market by geographic region, material type, major application and by end-use industry. This report profiles 18 key global players and 29 major players across the North America – 12; Europe – 12; and Asia-Pacific – 5. The report also provides the listing of the companies engaged in the manufacturing and supply of piezoelectric materials. The global list of companies covers addresses, contact numbers and the website addresses of 84 companies.